American Hero Quilts is an organization dedicated to giving comfort to our injured troops returning home from war. Every one of these American Hero Quilts is a uniquely patriotic quilt of heirloom quality, handmade with love. To find out how you can offer your sewing talents to serve an American Hero in need, visit the “How You Can Help” page at the AHQ website. 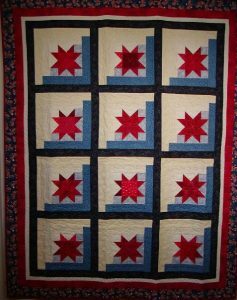 And if you need some inspiration to find a good patriotic quilt pattern to stitch up for AHQ, try checking out the American Independence free quilt pattern from Fons and Porter.com, this pile of free patriotic patters from McCalls Quilting.com, or this gathering of great tutorials from Quilt Insporations.com.